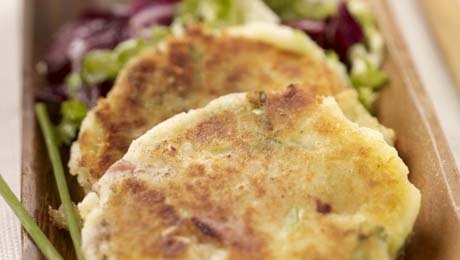 Potato cakes are absolutely delicious and a great way of using up some leftover mashed potatoes. You can add in whatever you wish in terms of fish, leftover bacon or chicken. Season lightly with a little black pepper. I normally, and if time allows, arrange them on a plate at this stage and transfer them to the fridge for at least 1 hour. Meanwhile heat a large pan with a little butter. Cook the potato cakes on both sides until they are golden brown. Make sure they are really well heated through-if you are a little concerned about them you could transfer them into the oven for a few minutes to ensure that they are really well heated through. Serve with a large salad and/or a softly poached egg. Simply Delicious! Fab recipe. A little confused with beverage suggestion "Wild Buck Merlot" for a back to school snack. I am thinking more a fruity SuperValu Apple and Blackcurrant!